(November 23, 2018) – The Maryland Department of Transportation’s State Highway Administration (MDOT SHA) continues to explore new and innovative ways to enhance safety for its growing and transformative network. For the first time starting next week, MDOT SHA crews will use an automated flagger instead of a human at a drainage project on MD 807 (Bedford Road) at the Patmar Drive intersection north of Cumberland. MDOT SHA is using the AFAD (Automated Flagger Assistance Device) technology along an active work zone to test the technology. Crews face great danger when controlling traffic with handheld “stop/slow” signs to alternate traffic. The AFAD eliminates the need for someone to stand on the road next to traffic – although the certified flagger controls the traffic flow from a safe distance off the road and remains nearby in case human intervention is needed. The project will replace an underground pipe to improve drainage in the area. The 900-foot work zone includes a reduction of the two-lane to a one-lane flagging operation during the day starting Tuesday, November 27 continuing through Thursday, November 29. 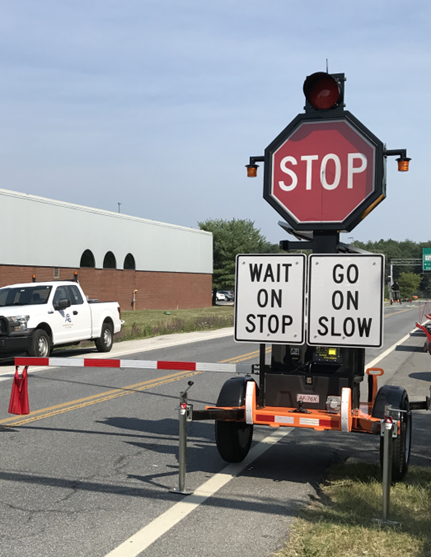 Drivers will see a trailer-mounted device that displays the same STOP and SLOW signs used in traditional flagging operations. MDOT SHA on-site staff will manage the equipment from a close, safe location along the shoulder. MDOT SHA is working with the Maryland Environmental Service (MES) as they provide oversight and manage the maintenance contractor Concrete General, Inc. and the traffic management contractor AB Construction, Inc.
Those who have questions may contact the MDOT SHA District 6 Office at 301-729-8400 or by email at shadistrict6@sha.state.md.us. Those who travel this route are asked to complete a brief survey about the AFAD technology via this link: https://www.surveymonkey.com/r/AFADMD807.